Split screen and responsive design in this One Pager for ‘Toggluv’ – a useful Mac App for time tracking tool Toggl. Not sure if I’m feeling the dead space on the left but I see what they are going for. Best viewed at <1160 in my opinion. Nice little touch with the timer for "Reading Toggluv.com" kicking off as the page loads. 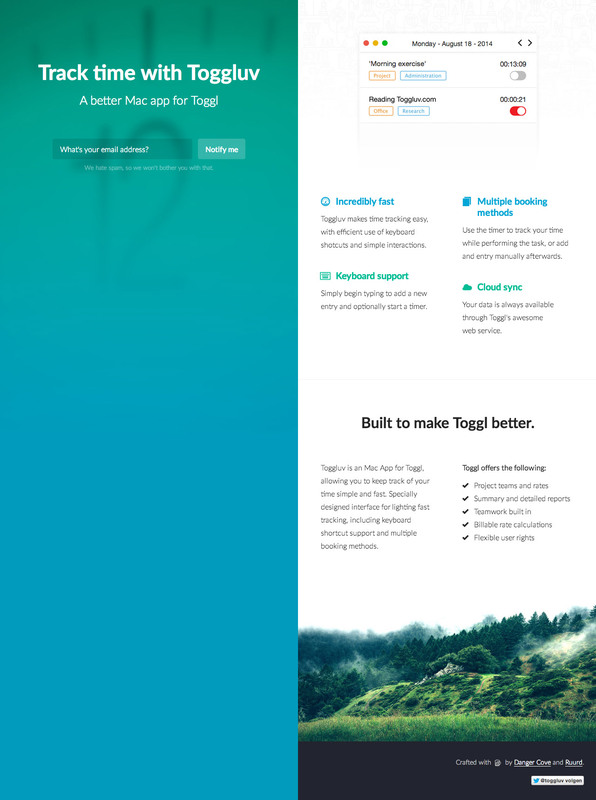 Toggluv is an Mac App for Toggl, allowing you to keep track of your time simple and fast. Specially designed interface for lighting fast tracking, including keyboard shortcut support and multiple booking methods.